The Catch Outcome	step catches outcome paths that are unconnected from the rest of the flow. It provides a universal mechanism for handling them. Usually this step is used to simplify or clean up your flow. 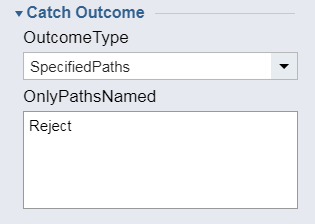 For example, if you have a certain outcome path that appears multiple times in your flow, you can use the Catch Outcome	step to handle the paths instead of connecting them individually. 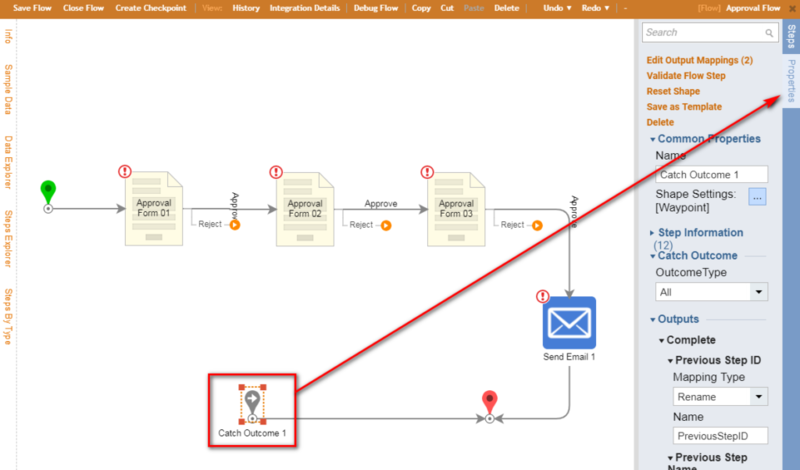 To add the component to a flow, in the Flow Designer Steps	panel on the right, under the category Flow Management	, drag a Catch Outcome	component to the workspace. 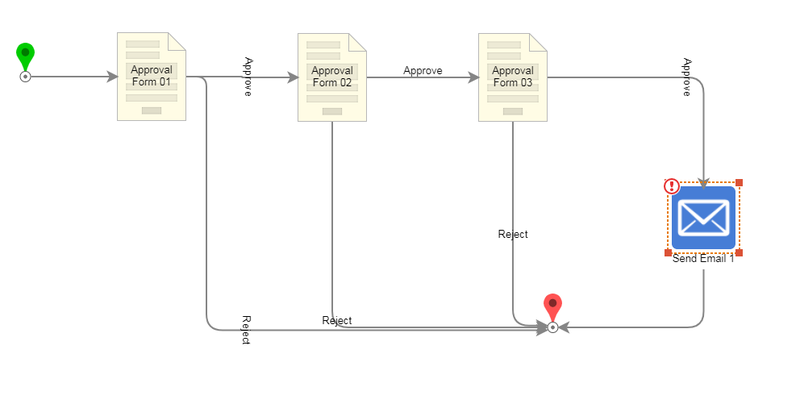 The flow shows a series of approval forms created with the Show Form	step. If one form is approved, the process moves on the next form. 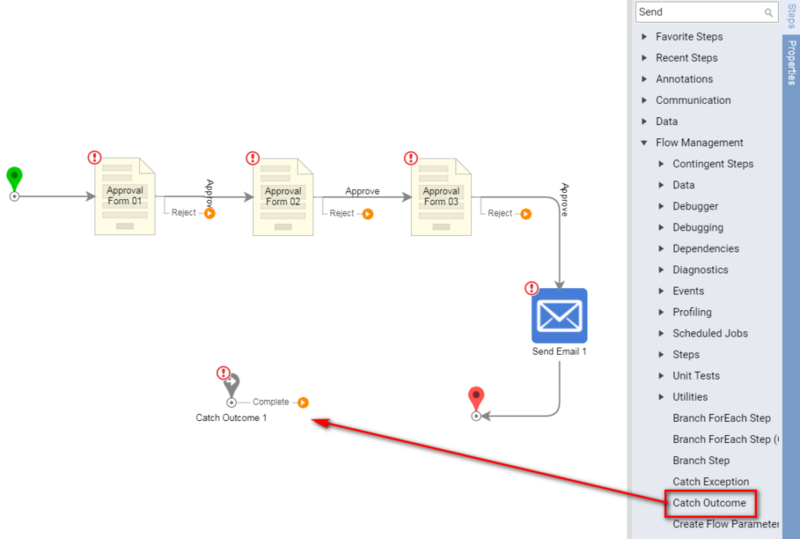 If all three are approved, the flow sends an email (Send Email	step). If any are rejected, the process goes down a reject path and ends the flow. Each approval form has a reject path that ends the flow. We will delete each of these paths and leave them disconnected. (Notice this causes error warnings appear). Now we add a Catch Outcome	step (in the Steps	tab on the right, under Flow Management > Catch Outcome	) and connect it to the End	step. Now we need to configure the Catch Outcome	step. At this point it doesn&apos;t know what outcome path it is supposed to catch; we will configure it to catch the Reject	path for all the approval forms. To do this, click on the step, then click on the Properties	panel on the right. In the top bar, click Validate Flow. If you set up the step correctly, the error warnings will disappear from the approval steps.